For the last few weeks I have been dabbling lightly with the best pre-run routine for long Sunday runs. I’m acutely aware of the need to fuel up before heading out but I’ve also become more in tune with the amount of time it takes for my body to wake up and go through its own routines. I’ve tried drinking coffee, not drinking coffee, not having breakfast, having light breakfast, and drinking lots of water regardless of the rest of the routine. I believe I’ve finally found something that works (thanks in part to the oatmeal suggestion from @crossn81). Part of the trick to the long run recipe is to start the day before. Knowing ahead of time that I would be burning well over 1,000 calories on my 20 mile run, I let myself indulge a little on Saturday. In addition to high fiber banana bread for breakfast and a well-endowed PBJ sandwich for lunch with sides of carrots and dip plus a granola bar, I enjoyed some mid-afternoon hot chocolate to fulfill a sugar craving and also keep the calories flowing. Dinner was high in protein and veggies with chicken stir-fry and I downed a bowl of kettle corn popcorn while watching a chick flick later. Saturday also including drinking lots of water. The rest of the recipe? Get a good 8 hours of sleep. Allow 1-1/2 hours to wake up and go through routine Sunday morning. Eat a bowl of regular oatmeal with half a banana and sprinkled with cinnamon and sugar almost immediately upon waking up to give time to digest. Drink one large glass of water. Stretch, move around the house, keep the body moving. Hit the head (a.k.a. bathroom for all you non-sailors) somewhere around 5-6 times, just to be sure. Check the temperature and hourly forecast. Worked like a charm. I’m glad to know I should not be hopping out of bed, straight into my running gear, and into a 3-hour route before going through this routine. I guess that’s the whole point of training. Find a routine that works, practice it, and reap the rewards of a good run. 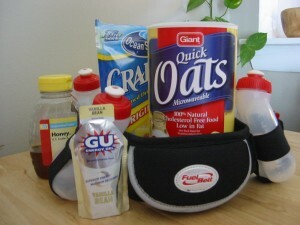 “Fueling and hydrating is based on a lot of variables, some personal to you, others include the weather, distance you are going, and things of that nature. 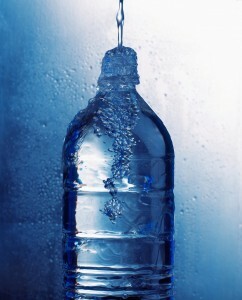 Most people, most of the time, can take in about 20-24 oz of water per hour. You may need less if you are a lighter runner or more on super hot days. You can expect to lose some weight after long runs. There really is no way you can replace everything on the run. In fact, if you weigh the same as when you started, you are probably over hydrating, which has its own set of issues (a lot of pit stops being one). Anything up to a 2% weight loss (at the end of the run) is said to be ok, depending on the length of the run and conditions. But, a 2% loss will affect your performance. Anything lost beyond that and you are officially and seriously dehydrated. Weighing yourself before and after are good ways to see how you are doing. In general you shouldn’t let your thirst guide you. 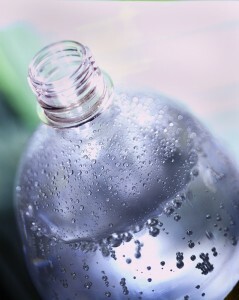 By the time you are thirsty you have usually lost 1% which equates to about a 5% decline in performance. [I shared with Christine my embarrassing problem of having to take pit stops sometimes while running…] Often right before or during the first part of a run, the body, anticipating the run or race, will want to void itself of any “extras,” which could be why you have to go. You’ll just be emptying what’s not being used, so it’s fine. Make sure you hydrate well prior to the run. This way you create stores in your body that can be used during the run. By this I mean days before and in the hours before. You want to start your race or long run with the tank full. The week leading up to an event you should try to get in a good amount of water. The water you store will get used first. To figure out how much water you should take in daily multiply your weight by .5-.6 to get fluid oz. A 130lb woman would therefore need 65-78 oz of water a day. You’ll have to experiment with what works best for you in the hours before your run. Runners have found success with drinking 2-4 hours prior and stopping fluid intake anywhere from 2 hours to 20 min before a run/race. The danger of drinking too much is greater for runners who take longer than 4 hours to run a marathon. They are the ones who are willing to stop and drink more. Faster runners tend to be the ones who dehydrate. Of course, in hot conditions anyone can fall prey to dehydration. We cannot neglect that you will also lose electrolytes during long runs as well. These will need to be replenished as you run. As with water, it isn’t possible to simultaneously replace what you are losing. For this you can add a sports drink into your fueling mix, gels, Gus, and the many other wide assortments of products out there. Again, you don’t want to overdo it, as this can lead to problems like stomach cramps, too much salt intake, etc. Not getting enough leads to bonking and serious performance drop. Eating something an hour or so prior to exercise has been shown to increase endurance, something we long distance runner can use. Shoot for something high carb. It only needs to be about 200-400 calories. Toast with jam is my favorite. Some people will just eat a couple gels and a sports drink. Here again it’ll take some experimenting to get your personal combo right. I take a gel about every 45 min during a long run. This in combo with water and some electrolyte drink, works pretty well for me. Check out Coach Christine’s website, www.therunningcoach.com; she is a true expert with much to share. I learned quite a bit from Coach Christine; mostly that I’m not hydrating enough in the days before a long run and that I can afford to have more than one Gu pack in a 20+ mile run. As she points out, it will take some experimenting to find what works best. If you have a long run recipe that works for you, please feel free to share! This entry was posted in Articles, Running and tagged coach, eating, fuel, hydration, long runs, recipes, Running, Training on February 17, 2009 by Natalie.